Cannot be Special Summoned. 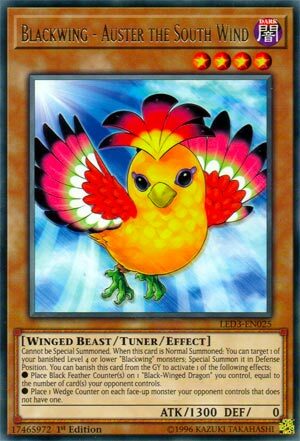 When this card is Normal Summoned: You can target 1 of your banished Level 4 or lower “Blackwing” monsters; Special Summon it in Defense Position. You can banish this card from the GY to activate 1 of the following effects; ● Place Black Feather Counter(s) on 1 “Black-Winged Dragon” you control, equal to the number of card(s) your opponent controls. ● Place 1 Wedge Counter on each face-up monster your opponent controls that does not have one. I didn’t want to go from Archetype Boss Monster to Archetype Boss Monster two days in a row with a whole month getting dedicated to this, so I thought I’d randomize it a bit and go to the Blackwing support, Blackwing – Auster the South Wind. Place Black-Feather Counters on a Black-Winged Dragon you control up to the number of cards your opponent controls. Place 1 Wedge Counter on each face-up monster your opponent controls. So Auster is meant to help with some of the Synchros of Blackwings that use counters like Black-Winged Dragon, Blackwing Armor Master, and Blackwing Full Armor Master. I’ll obviously talk about Full Armor Master later, but Blackwing Armor Master can use the Wedge Counters to remove from monsters and make their stats 0 and Black-Winged Dragon will use the Black-Feather Counters to debuff an opponent’s monster’s ATK and DEF as well as burn your opponent for 700 per counter removed. Nice to have a better way to use the Counter Effects of some of the Blackwing Synchros, though Black-Winged Dragon isn’t really part of the Blackwing archetype. Auster is a great Tuner for the Blackwing archetype and is searchable off Black Whirlwind, so I guess it is good it has lower stats. If you are playing Blackwings, Auster is a Tuner you are likely going to play. Art: 3.5/5 Almost looks like a Chicken and a Turkey mix, love the coloring scheme of the feathers though. Blackwing-Auster the South Wind…Blackwings have such cool names (and usually equally nice art) but this is a Dark, Level 4, Winged-Beast, Tuner Monster, with 1300 attack and 0 defense. Both those leave a little to be desired, and I’m sure, whether you play(ed) Blackwings or not, you know how much support they have (Winged-Beast includes Icarus Attack) and Dark is muy bueno too. You’ll note the unfortunate tidbit this card can’t be Special Summoned, so let’s note that immediately. But when this card is Normal Summoned, you’re allowed to Target and Special Summon one of your Blackwings that is Level 4 or lower, so long as it’s removed from play. This immediately open up Synchro, XYZ, and Link possibilities to be used and abused, which is good. Art: 4.5/5 Cute, colorful, kinda reminds me of Toucan Sam, the body looks like a pear, and the feet are a bit odd, but again, I love the color.